Recently, I decided to visit the House of Blues walk up window at Downtown Disney in Lake Buena Vista, FL. I have heard many great things about the BBQ at House of Blues, so I decided I needed to give it a go! I walk up and the smell of smokiness is in the air! I love good smokehouse BBQ, who doesnt? I debated on the items they have, Brisket, pulled pork, pulled chicken, among some other choices like hot dogs. So I decided on the pulled pork sandwich with baked beans and cole slaw. About 5 minutes after waiting, they came to me telling me they are out of pulled pork, so I picked the pulled chicken. They did however give me a free soda for the inconvenience, which was a plus! I received my food and sat down nearby at the tables outside. It was a great rock and roll music ambiance with some music from a live band in the background. Not only did I get BBQ, I get some great songs to go along with it! I decide to try the baked beans first, they were a bit on the savory side, however in my opinion needed to be sweeter. Then on to the cole slaw, it was actually pretty good, however again no sweetness at all. If you like tangy cole slaw though, this is the place to get it! A waitress came around and made sure I had everything I needed, which I thought was very nice! 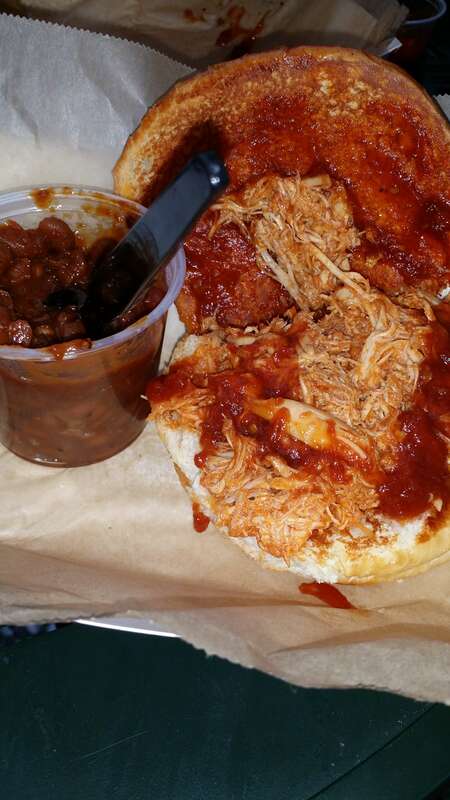 I then moved on to the pulled chicken sandwich, which came with a side of BBQ sauce. The sauce itself was very good. I took a bite of the sandwich and was pretty satisfied, however it was missing a lot of the smokey flavor that I was smelling in the surrounding area. All in all was pretty satisfied. A good place to check out, and fairly cheap as well compared to other places around. Especially if you don’t want to wait 3 hours for food elsewhere! I definitely recommend giving this place a try if you are looking for a good quick bite! Next Post Teenage Mutant Ninja Turtles take over Nick Hotel this summer!